If you eavesdrop on the culinary press and tastemakers, you are likely to overhear the bombastic claim that French haute gastronomy is dead. What this translates to is that French gastronomy now shares the limelight, as markets seek to shift and expand, and novelties are most expedient to the marketing apparatus. Thus, in a more tentative economy, the trend ordained “bistronomy” overtook Paris and the international press, followed by the development of the so-called Japanese inflections on French cuisine. I say so-called because often the Japanese interpretation of French cuisine is lightened to appeal to a broadly conceived international palate. It does not claim to evoke the gamut of Japanese flavors and textures, which cannot be carried over in the metaphor that the press exploits too easily. Despite resulting in a good restaurant here or there, these mid-market movements have led to no visible improvement in the repertoire nor to any iconoclastic dishes of the kind effected by the continuing spirit of nouvelle cuisine from the 1960s up until the market tightened at the start of the 21st century. But this begs the question of how the French inheritors of the nouvelle cuisine have aged in a culinary world that has globalized to the degree that underdeveloped markets such as Scandinavia have been led, often unprepared, on stage. This summer I embarked on an anachronistic tour of the pioneers of nouvelle cuisine and their successors, to include such temples as Bras, Marc Veyrat à la Maison des Bois, and the Swiss Restaurant de l’Hôtel de Ville de Crissier. In this series, I offer a glimpse of how a few of these restaurants are operating, starting here with Troisgros in its new location at Ouches, and to be followed by a discussion of L’Arpège in the forthcoming installment. Compared against the Classical French repertoire, Troisgros and L’Arpège may be modern restaurants but should we qualify them as intuitively modern? Three summer lunches at Troisgros at Ouches and L’Arpège would suggest that may be a fitting appellation. The Troisgros family and Alain Passard are both intrepid seekers, respectively, for the potential in the application of acidic or bitter notes to fat and the possibilities of vegetable manipulation and integration. Sometimes these experiments result in wild successes. At other times, one senses the intentionality but finds the dish conception shortsighted. However, generally one feels that neither institution is adapting to trends but rather possess a heightened intuition of how to achieve harmony through their own style of experimentation. They also manage to balance these excursions into the modern with a filiation to the past, such as when César revisits the Veneto classic of grilled eel and radicchio Treviso or when Passard roasts a magnificent pigeon. One thing is certain: in its maturity, France is immune to the gross missteps of emerging gastronomic scenes, and Troisgros and L’Arpège benefit by simply eschewing obvious errors that surface in newer markets such as Scandinavia or Belgium. Troisgros’ recent relocation to a verdant bois at Ouches is enchanting. It recalled the setting of a Perrault fairy tale, an ideal environment in which to experience a cuisine that often borders on fantasy. The tables are arranged along the perimeter of the expansive dining room, boisé and minimally decorated to allow the variegated green of the natural surroundings to shine through. The setting does not distract from the cuisine but seamlessly integrates with its playful spirit, and I like the cloudlike place settings. A single amuse was a tartlet of razor thin slices of champignon de Paris and green apple, seasoned with parsley dust. It was ethereal and layered, an ideal awakening of the senses. The raw champignons complemented the yeastiness of a serviceable Duval-LeRoy 2006 Blanc de Blancs and the green apple matched the vibrant fruit of the Champagne. I imagine that there exists a graduated progression in the tasting menu, but as I chose to order à la carte, I found this was sufficient to reset and titillate the palate. In any case, a single amuse of this nuance certainly leaves a more lasting impression than a series of small but insignificant bites. Bread was a buckwheat brioche of excellent quality. I should add that it is a joy to interact with Monsieur Thierry, who exudes a genuine pride and the desire to share the rich culinary heritage of the Troisgros family. That said, he is not as forthcoming as a Monsieur Pascal Vettoux at L’Ambroisie, who readily intervenes to balance one’s meal chosen à la carte. As such, I found that four savory courses en demi portion, one from each of the menu subcategories, resulted in a protein-heavy meal without sufficient forethought to balance or progression. The tasting menu appeared to be composed of lighter interludes, but it would have been nice to see a citrus-based dish appear unsolicited. Perhaps it is advisable to be deliberate in one’s communications here. 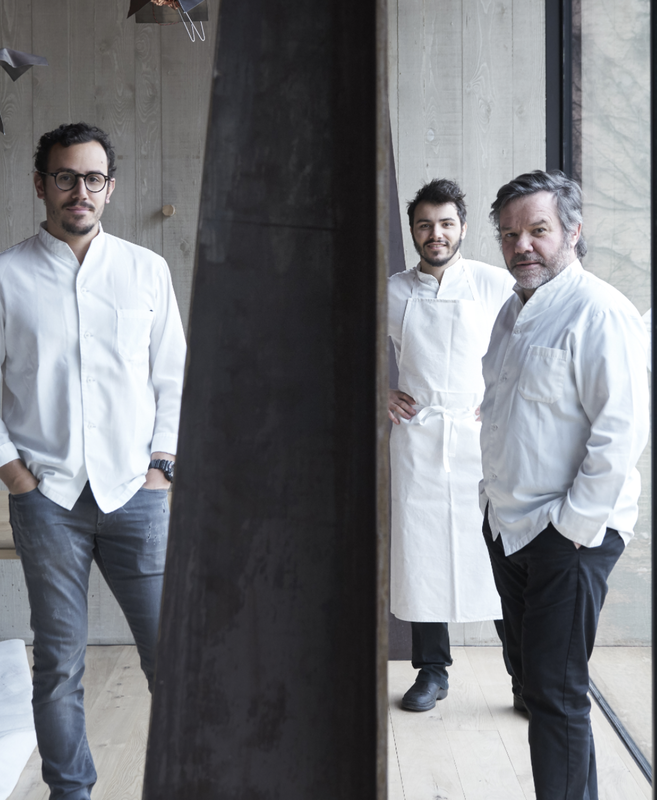 I cannot think of a restaurant where filiation and memory inform the cuisine as authentically as they do at Troisgros. The filiation can be of the generational, cultural and/or mnemonic variety. If Michel recalls the incomparable tomato sauce of his Friulian grandmother, implied is the combination of umami and acidity that enticed him at an early age. This meal evinced that the cuisine acidulée of Troisgros does not consist merely in the monolithic acidity that can mar the dishes of certain New Nordic restaurants. There is, in addition, the umami of reduced red wine and that of red vinegar. With his “opus de tête de veau à la tomate et au cèpe,” César managed to elevate an offal dish of gelatinous tête de veau with a meaty porcini. The red vinegar lent a warmth and umami depth to the dish, in place of merely cutting the richness as would a traditional white vinaigrette with mustard, and the marinated tomato lent a similar acid/umami note. A hearty welcome, the dish is comforting with the vigor of color and acidity. In another gesture of filiation, César payed homage to a traditional Veneto dish of grilled eel and radicchio di Treviso, though the herb butter quenelle and rehydrated raisins are well-conceived flourishes. Certainly, they enliven the dish with a piquancy that helps to lift the heft of the eel. The eel flavor and texture will hardly compete with Japanese anago that is fattier and more yielding. However, the ingredient combination is intelligent. The raisins are an elegant substitute for the sweetness-acidity of balsamico that would traditionally dress the Treviso. That is why tasting together the ensemble of ingredients is necessary to experience this synthesis of meaty, bitter and sweet-acid. You cannot imagine a single ingredient being omitted for the ensemble to harmonize on the palate as it so magnificently does. Contemporary food criticism possesses an affinity for the term “deconstruction” to signify the extrication of a dish’s component parts. This is mildly counterintuitive because the philosophical movement of deconstruction sought to demonstrate how the linguistic elements of a concept or statement do not coalesce in an organic way. On the contrary, in the case of César’s eel with Treviso, he isolates the components so that you understand their natural cohesion when tasted together. At Troisgros, the experiment’s aim can usually be intuited, even when the dish falls short of success. “Ronde de saint-pierre et de truffe noire” will entrance the eye, it is like stumbling upon mushrooms in the forest, the lamellae visible on the ribbons of John Dory which stand erect. The dish will also intoxicate the nose. The intention behind reworking St. Pierre with truffe noire is immediately apparent in that you will be enraptured by the aroma of the fresh black truffles from Australia adorning each ribbon of fish. The more evenly distributed heat of the protein favors a more expansive aroma than would a truffle-lacquered tranche, especially with the addition of an aromatic nage truffé. Unfortunately, the elation of discovery ends when you taste the dish. Each ribbon of St. Pierre has been roasted quickly, but the gelatinous texture one would taste in the mid-portion of a filet is substituted by a more toothsome and less unctuous mouthfeel of cuts that are as thin as tataki. I would like to re-taste this dish to see if the execution was off on my visit, or if, as I suspect, the concept favors aroma and visual aesthetic over the flavor and mouthfeel that can only be experienced in a thicker tranche. Ingredient quality at this meal was uniformly high and nowhere more evident than in the quality of lamb chops. I was enjoying them so much I neglected to ask Thierry the provenance, but the fat integration and depth of flavor even overshadowed the lamb I tasted at the Sportsman on the same trip. Marinade and caramelization stem back at least to Michel père’s iteration and allow the complex flavor of the crust to serve as a foil to the juicy flesh. The lamb was aggressively sauced with Middle Eastern spices and accompanied by some excellent girolles and roasted aubergine in a spicy sauce with buckwheat. A dish of this assertiveness would find its ideal partner in a great Côte-Rôtie by Jamet but I settled for a glass of Grand Cru Pessac Leognan by Chateau Latour-Martillac. My prior comment about meal progression also applies to the desserts at Troisgros. The modern desserts are precisely calibrated surprises which dazzle the eye and the palate, but I am missing a trajectory towards a more dramatic effort, of the grandeur of Le Squer’s grapefruit masterpiece. That said, the edible egg with yogurt mousse “white” and kumquat yolk served as a refreshing palate cleanser and dessert of its own right. The papillon, which will likely delight any Japanophile, is nearly as colorful on the palate as it is on the plate. An intuitive touch with the accompanying fraises de bois consists in the surprise of an underlying layer of strawberry gelée. While the fraises de bois were not as ripe or of the same quality as those at L’Ambroisie in the spring or the ones Cerutti sourced in times past at Louis XV, the underlying gelée was such an understated touch to increase the intensity of each spoon, it fits with the overall spirit of Troisgros. Likewise, a sweet dim sum of dumplings filled with almond milk or hay cream, and topped with Cappuccino foam, was a flavor burst worthy of anticipation. That said, none of these desserts would feel sufficiently opulent on its own in a restaurant of this level. Moreover, cream filled choux pastries topped with juice bursts were repetitive and probably not representative of the best of what Troisgros offers as mignardises throughout the seasons, and the acid will not marry well with an after-dinner coffee or brandy. This meal was instinctive with precise cooking and walked the line elegantly between homage and experiments of an incremental nature. My main caveat was that the relatively casual atmosphere and service are not conducive to orchestrating meal progression, but then I am not certain that an equally playful chef Gagnaire with a more formal staff achieves this either. I look forward to revisiting Troisgros to obtain a more reliable assessment and to observe the progression of the tasting menu. The Ouches location is simply a fantastic environment in which to experience the equally charmed cuisine of César and the chaleur and hospitality of the Troisgros family.